RLCS, Revista Latina de Comunicación Social, 72 – Pages 560 to 573 Funded Research | DOI: 10.4185/RLCS, 72-2017-1179| ISSN 1138-5820 | Year 2017 forecast of possible future scenarios that are favourable to the business interests and keep risk and uncertainty to a minimum. In this study, Emotion includes the Experience of the public, user and consumer, i.e. the experiential relationship with the company or organisation as a result of the management of the latter. We can categorise Emotion into six major areas, which can be divided into subsections that will facilitate classification and analysis: 1) Products, Services and their Marketing; 2) Work biosphere; 3) Corporate Ethics; 4) Social Responsibility; 5) Corporate Senior Management; and 6) Solvency and Profitability. By Management of the company or institution we understand what the latter does and says, getting a response or feedback from its stakeholder. Feelings and Emotions are the states of mind, moods, of the stakeholders resulting from their experience with the management of the company and the environment (of both and one), i.e., their reactions to their experiences. The manifestation of this mood and willingness constitutes the Attitude, predisposition, beliefs, intention of conduct towards a company, institution or organisation, its services, products and brands, most of the times acquired through experiences and emotions, of their own or of others, and that dictate specific behaviours with a specific impact. When the attitude is not of their own, influencers come into play: social “influencers”, i.e., influences and recommendations when they are considered generators of opinion trends, and financial influencers when the information provided has direct impact on the economic variables of the business. Therefore, we define emotion as the state or states of mind or moods generated as a reaction or consequence of the experience of the public, user-consumer, with the company or institution, affected by influences and recommendations, that is, beliefs, intentions, or behavioural predispositions, which can be of their own or of others and that determine an attitude and, in short, affect the business, objectives and management of the company or organisation. The second variable that we will include in the hypothesis is the Business or Objective/s of the company or institution, i.e., the value resulting from the business management and from the relationship of the company with stakeholders and from the feedback from the latter to the former. This value represents a tangible indicator that can be objectively observed, which for this study is the share price (at the close of the market) of the companies included in the sample. After having defined the main variables, although some aspects will be clarified later, we can formulate our hypothesis in the following way: The Emotion and Business of a company or organisation are directly related: if the emotion is positive, then business (economic performance) increases and if the Emotion is negative, then the Business decreases. We developed our hypothesis in the following way: The Emotion, defined as factor or intangible value, and the Business of a company or organisation, understood as the price share (tangible indicator), are directly correlated in the sense that, if the emotion is positive, i.e. if the mood is positive as a result of the experience of stakeholders, expressed through opinions and comments on different digital sources, then the economic result of the company, its Business, that is, its stock exchange rate (at the end of the day) increases positively. Conversely, if the Emotion is negative, i.e., if the mood is negative as a reaction to the experiences of the user-consumer with the company and its environment, expressed in the opinions collected in digital sources, then the business is negative, i.e., the stock share price. RLCS, Revista Latina de Comunicación Social, 72 – Pages 560 to 573 Funded Research | DOI: 10.4185/RLCS, 72-2017-1179| ISSN 1138-5820 | Year 2017 expansion). The Emotion, which has been already defined, is understood as the state of mind of stakeholders, towards the organisation and the environment in which they both operate. The emotion can be primary or innate and secondary or learned. The initial aim is to determine the “tendencialisation” in a period of time that allows us to know the stakeholders perceive a company or organisation, their actions and communications, their impact on the experience of the users-consumers (end-customers, but also other stakeholders if our perspective fits into the area of internal communications -employees, suppliers, etc. ), and the impact of usersconsumers on the company, translated in opinions and emotions. This allows us to obtain a complete picture of the environment of the institution, and the influence and impact of the experiences and emotions on the objectives and business. Therefore, it is feasible to influence those experiences and emotions to change the trend and influence the decisions of these audiences in favour of the objectives pursued, reducing uncertainty, given that we would already know the ideal scenario we hope to achieve based on present and past scenarios from which intangible factors have been quantified to draw the line of evolution of the interrelation between the organisation and userconsumers (either positive or negative), and to reduce the risk in decision making, which should follow a Strategic Foresight Plan. 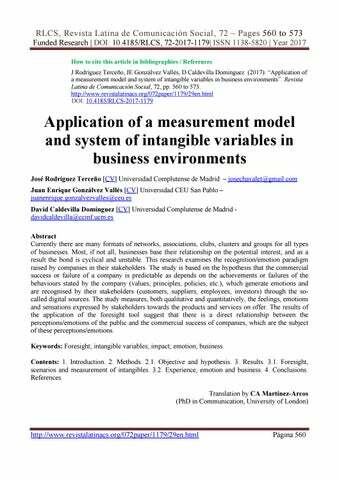 In other words, we use the measurement of intangible factors as a foresight tool to predict, and influence in its creation, plausible future scenarios that are favourable to the objectives and interests of our organisation, company or institution. The measurement of these intangible factors, agents or actors, through their classification, assessment and quantification, provides data about the real impact they have on the company, for example, in terms of sales, stock market trading prices, corporate image, social responsibility, etc. With a general but also sectorial, categorised and sub-categorised image we can isolate positive points or peaks, i.e., those where certain experiences and emotions affected and influenced positively on the objectives and interests of the company to modify a negative trend (which would lead inevitably to a negative scenario) and channel the information towards positive experiences and emotions. 3.2. Experience, emotion and business Data were collected during the first half of the year 2015 (1 January to 30 June), resulting in a total of 281,407 entries from various digital sources, which were subjected to the analysis and quantification of Emotion, as mentioned above. The total number of entries make up what we have termed Inferred Information or Net Information, and which is divided into the six categories of experience, as shown in the following figure: After quantifying emotion, it was correlated with the selected tangible indicator, the share price, to check the impact and influence of the former on the latter, as well as the direct or indirect relationship between them, which we have accepted a priori, i.e., to test our hypothesis (which says that there is a direct relationship exists, that if emotion was positive, en the share price would increase and that if emotion was negative then the share price would decrease. RLCS, Revista Latina de Comunicación Social, 72 – Pages 560 to 573 Funded Research | DOI: 10.4185/RLCS, 72-2017-1179| ISSN 1138-5820 | Year 2017 Figure 3. Inferred net information by categories. Source: Authors‟ own creation based on the First Report on Intangible Assets in Digital Ecosystems (Peláez, 2016). In the first place, we will pay attention to the figure that correlates attitude and business, the share price, based on the data extracted from the First Report on Intangible Assets in Digital Ecosystems developed by the University of Málaga (2016), which considers, for the analysis of Emotion, those attitudes relating the financial influencers, distinguishing between investment recommendations (positive Experience-Emotion) and negative recommendations (negative Experience-Emotion). The previous figure shows the direct relationship between Attitude, among the recommendations, whether positive or negative and the closing share price. Thus, we observe that when the value of the Attitude, of the recommendation, is negative, as in 12 February, 30 April, 28 May 28, to cite three peaks of significant negative decrease, the closing share price experienced a similar negative drop. Conversely, when the recommendation, the attitude, is positive, the share price increases proportionally, most of the time. This happened on 26 February, 26 March, 9 April and 23 April, to cite significant peaks in the six-month period under study. Source: First Report on Intangible Assets in Digital Ecosystems (Peláez, 2016). RLCS, Revista Latina de Comunicación Social, 72 – Pages 560 to 573 Funded Research | DOI: 10.4185/RLCS, 72-2017-1179| ISSN 1138-5820 | Year 2017 ascending Emotion is not reciprocated with a rising positive share price, at least in the global line of the time period under analysis and in a proportional way. Figure 5. Emotion and business (share price). RLCS, Revista Latina de Comunicación Social, 72 – Pages 560 to 573 Funded Research | DOI: 10.4185/RLCS, 72-2017-1179| ISSN 1138-5820 | Year 2017 significant and similar variations on both lines would have been clearer in this meaning), but the trend, as we say, coincides and holds. 4. Conclusions Therefore, and by way of conclusion, based on the results we can corroborate the hypothesis raised initially. There is a direct relationship of involvement and influence and, in general terms, which is necessary to forecast possible scenarios and future lines of action. The results are, therefore, sufficiently significant to reduce, significantly, risk and uncertainty in the actions and decisionmaking of the company or organisation, provided these trends are considered in the long term and the analysis is not reduced to a single semester, which is required by strategic foresight plans. Moreover, we can make some adjustments to the measurement model and the method used, such as including improvements in the quantification model, adding more concepts and keywords to sieve we used to filter the collected information when applying the semantic differential analysis, or to specify more, whenever possible, the valuation of the Emotion, to obtain more numerical data to weight. We could also filter and select, going a step beyond, the inferred or net information and subject to the analysis only those Experiences and Emotions relating, in our case, to stack market information and prices. Therefore, to conclude we want to highlight the usefulness of models for the measurement of intangible variables, like the one exposed here. These models are a very important part in the real valuation of a company or organisation, which requires the management of the emotions, feelings, attitudes, beliefs, intentions and opinions of stakeholders, be they employees, suppliers, or customers. This Emotion, which is characterised by uncertainty, according to the business or organisational perspective, is one of the most capital factors within strategic foresight business plans, which aim to provide plausible scenarios where risk, in terms of actions and decision making, is reduced as much as possible. Therefore, the use of tools to measure intangible assets is essential, particularly because these tools allow us to determine (quantify and qualify) when and how Emotion affects the results of the Business. 5. References Andreu, J.M. (1990): Banca universal versus banca especializada: un análisis prospectivo. Instituto de Estudios de Prospectiva. Madrid. Bas, Enric (2002): Prospectiva: cómo usar el pensamiento sobre el futuro. Ariel. Barcelona. Bas, Enric (1999): Prospectiva: herramientas para la gestión estratégica del cambio. Ariel. Barcelona. Bueno, E. (1993): Fundamentos de economía y organización industrial. McGraw Hill. Madrid. Caldevilla, D. (2009): Relaciones públicas: iberismo y prospectiva. Vivat Academia; 107: 1-49. Castaño, C., Arranz, F., León, Omar. (1990): Tecnología y empleo en el sector financiero español. Instituto de Estudios de Prospectiva. Madrid. Article received on 18 on December 2016. Accepted on 29 May. Published on 2 June 2017.